Do you ever wonder if, in the end, all religions are the same? Could any of the world’s religions be God’s way of revealing himself? Check out the different types of religions, and decide for yourself. There are many religions in the world, but books on comparitive religion often refer to the twelve major religions which together are believed by more than 80% of the world’s population. 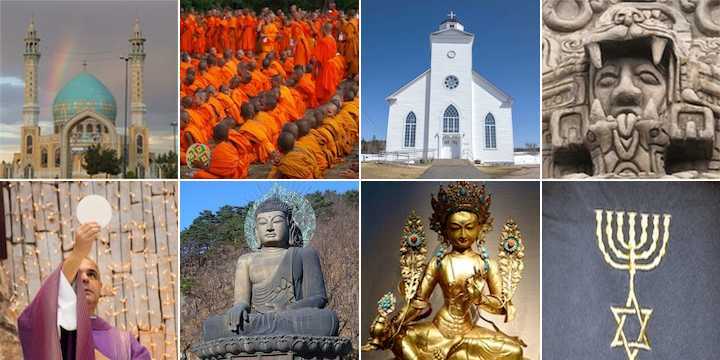 Some of the main features of these 12 religions are shown at 10 facts about 12 major religions. These religions can be broadly grouped into four categories each with different features. In each case you may like to ask yourself: Is there sufficient evidence to show that any of these religions is true? Could they all be more or less true? Are there reasons which make these beliefs less plausible now than when they first began? include about 51% of the world’s population. have exerted significant influence on western civilisations from the later Roman Empire onwards, including the growth of modern science and the development of modern democracies, social welfare, education and medicine. the other dharmic religions are based on Hinduism (which is the oldest) and/or are a reaction to it. respect for ancestors, family, society and government, as part of living in accordance with the Tao. originated worldwide, but mostly in Africa. includes about 17% of the world’s population. So, are all religions the same? It is obvious that the major religions are all very different. Most believe in a God, though God isn’t part of Buddhism. Most offer believers some advantages, though these differ greatly, and the way to receive them can be very different. Most give believers a way to live and to worship God. But since the Gods of the different religions reward different behaviours and require different beliefs, there are significant, and often very practical, differences. Few believers in any religion think the other religions are the same. This page is just a summary. If you want to look at more detailed information on each religion, see 10 facts about 12 major religions. Or you may be interested in considering whether any of these religions point us to the true God who made the universe and the human race, in which case you may be interested in how we may make judgments about each religion. Some ideas for this are provided in Choosing my religion. Photos: MorgueFile – Mosque, monks, white church, idol, priest, Buddha, Hindu goddess, menorah.